Palestinian amora of the first half of the fourth century; pupil of R. Jeremiah, in whose name he reports some halakic and haggadic sayings (Yer. Dem. 21d; Pes. 36d; and frequently). That the name "Neḥunya," from which are derived "Ḥuna" and "Ḥunya," designates Huna is shown by the fact that a saying which is quoted in the Pesiḳta (xviii. 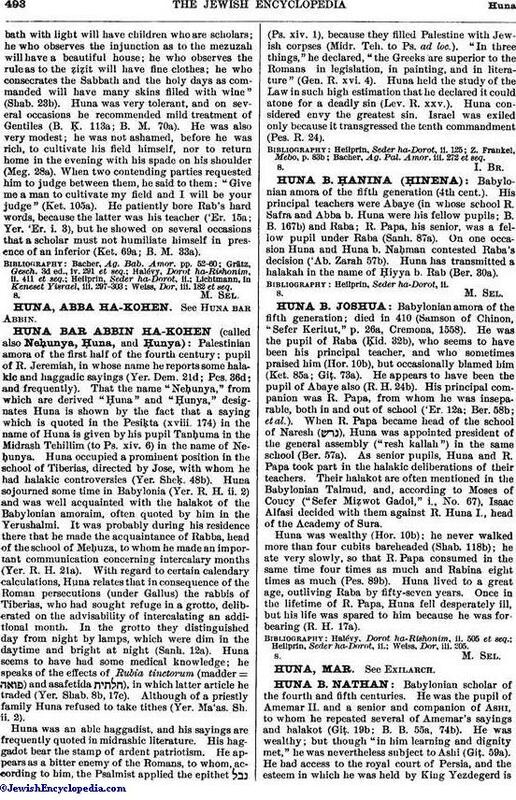 174) in the name of Huna is given by his pupil Tanḥuma in the Midrash Tehillim (to Ps. xiv. 6) in the name of Neḥunya. Huna occupied a prominent position in the school of Tiberias, directed by Jose, with whom he had halakic controversies (Yer. Sheḳ. 48b). Huna sojourned some time in Babylonia (Yer. R. H. ii. 2) and was well acquainted with the halakot of the Babylonian amoraim, often quoted by him in the Yerushalmi. It was probably during his residence there that he made the acquaintance of Rabba, head of the school of Meḥuza, to whom he made an important communication concerning intercalary months (Yer. R. H. 21a). With regard to certain calendary calculations, Huna relates that in consequence of the Roman persecutions (under Gallus) the rabbis of Tiberias, who had sought refuge in a grotto, deliberated on the advisability of intercalating an additional month. In the grotto they distinguished day from night by lamps, which were dim in the daytime and bright at night (Sanh. 12a). Huna seems to have had some medical knowledge; he speaks of the effects of Rubia tinctorum (madder = ) and asafetida ), in which latter article he traded (Yer. Shab. 8b, 17c). Although of a priestly family Huna refused to take tithes (Yer. Ma'as. Sh. ii. 2). Huna was an able haggadist, and his sayings are frequently quoted in midrashic literature. His haggadot bear the stamp of ardent patriotism. He appears as a bitter enemy of the Romans, to whom, according to him, the Psalmist applied the epithet (Ps. xiv. 1), because they filled Palestine with Jewish corpses (Midr. Teh. to Ps. ad loc.). "In three things," he declared, "the Greeks are superior to the Romans in legislation, in painting, and in literature" (Gen. R. xvi. 4). Huna held the study of the Law in such high estimation that he declared it could atone for a deadly sin (Lev. R. xxv.). Huna considered envy the greatest sin. Israel was exiled only because it transgressed the tenth commandment (Pes. R. 24). Bacher, Ag. Pal. Amor. iii. 272 et seq.